Recipe: Sprinkle the flour over your kitchen counter and roll the pizza dough to the desired size. Grease a pizza pan with the olive oil and place the pizza dough on it. Spread the pizza sauce over the pizza dough, leaving the edge free of sauce. 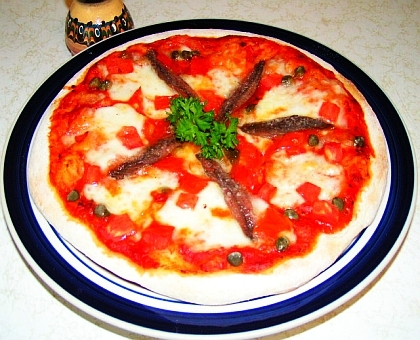 Top with the bocconcini cheese, anchovies and diced roma tomatoes evenly over the pizza and place it in a preheated oven at 450 F. Bake for about 15 minutes of until the edge of the pizza turns golden and the cheese is nicely melted. If the top of the pizza is cooking faster than the bottom, remove the pizza pan from under the pizza and cook it directly on the oven rack. Alternatively, use a perforated pizza pan. Cooking tip: For more intense flavor, brush the pizza dough with garlic-infused oil before applying the toppings.